Melissa was very excited to sign up for making this baby gift set because she’s at the age where all her friends are having babies. 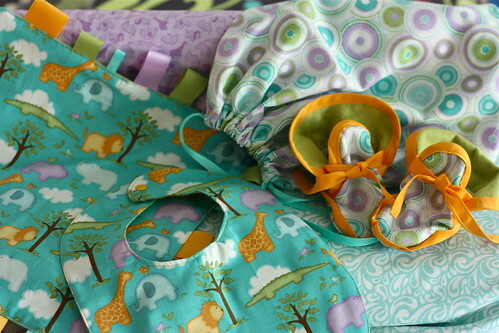 She is always in need of a great gifts for baby showers. 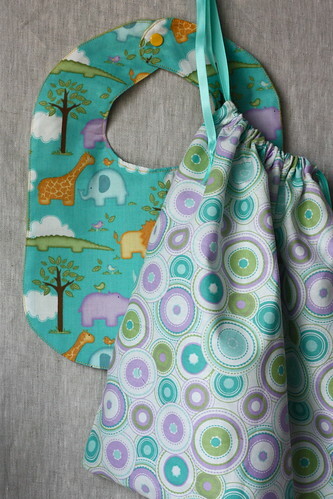 Bib: Super easy to make. In fact, it took about 15 minutes total to put the whole thing together. Melissa will make this one again and maybe put a little pocket on the bottom front to catch food. It would also be really cute with a fork appliqued on it. Taggy: LOVE this project. It turns out really really cute and I think any little guy or girl would love to have this for a stroller or car ride. So sweet. I am going to make more of these!!! Bag: What a great little bag. A parent could use it after the present is given for a thousand different things. Next time, Melissa might applique an initial on one side to personalize it a little. 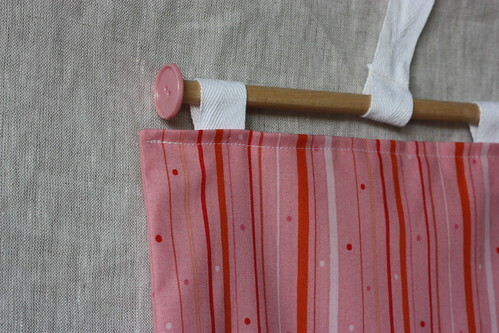 The bag would be so useful made of laminated cotton as a wet bag for traveling with cloth diapers/wipes. Tip – When making the casing for the top of the bag, the end result should be an opening on opposite sides of the bag to encase the ribbons to cinch the bag closed. Booties: Melissa decided being a cobbler is not in her future. As a visual person Melissa had a hard time with Step 5 of the booties. The Pink Chalk Team was consulted and the booties were finished! 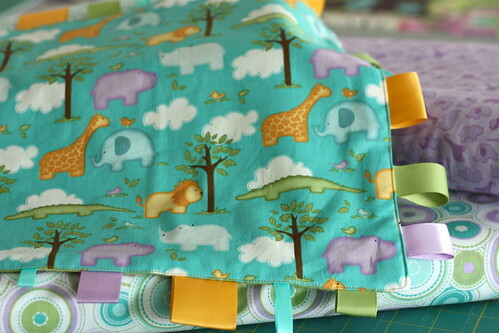 The Taggy is destined to be the favorite blankie for a sweet little one! Ahoy! Carrie loved the Pirate Growth Chart pictured in the book but alas she has little girls to sew for. Out came the pink fabric for her nieces. The wall hanging/chart is simple and straight forward. A lot of thinking began when a girly motif was selected. After some chat with the Pink Chalk Team, Carrie decided on a giraffe. Diana found a color book drawing and adjusted the size to fit. Carrie followed the pattern steps from here on out. In step 2, Interface the Felt, she attached her double- sided interfacing to felt for the chart numbers and fabric for the giraffe. 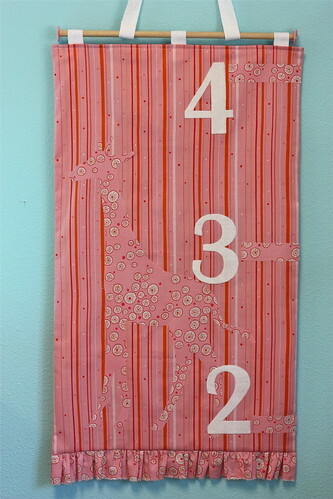 After the numbers and giraffe were ironed on she added a ruffle to “girly” it up some more. 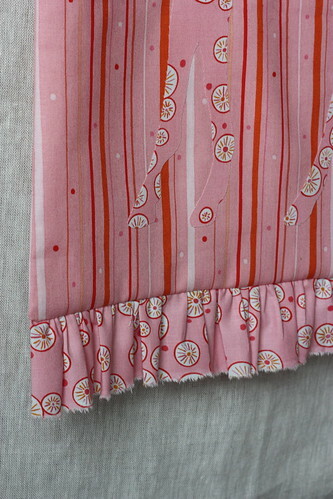 The ruffle was made by snipping the selvege and tearing the fabric to create the soft edge. The fabric strip was (36”),double the width of the chart . Carrie divided the ruffle strip and marked the chart bottom in 4 equal parts. She then ran 2 rows of basting stitch along the cut edge of the ruffle piece to make gathers. The strip was pinned to the bottom of the chart right sides together matching the marks. The ruffle was turned in ½ inch on each side so as not to get caught in the seam when attaching the back. She is looking forward to seeing marks up the side of the chart as the little girls grow. She plans to include a fabric marker with the growth chart.